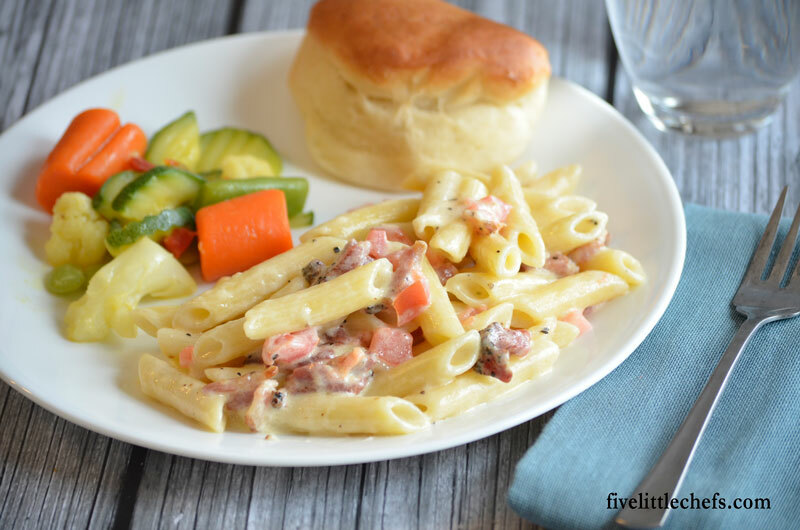 Bacon Alfredo Pasta is combining a few things we love about a plain fettuccine alfredo recipe. I learned a few years ago that fettuccine and spaghetti noodles are really hard for my kids to eat. They need help cutting the noodles but then it still seems the noodles go all over the place. It was then I started using other types of pasta. Anything that they can stab with a fork was what we chose to use. Another thing we love about alfredo is course ground pepper. I put some in the recipe but then always add more to my portion. 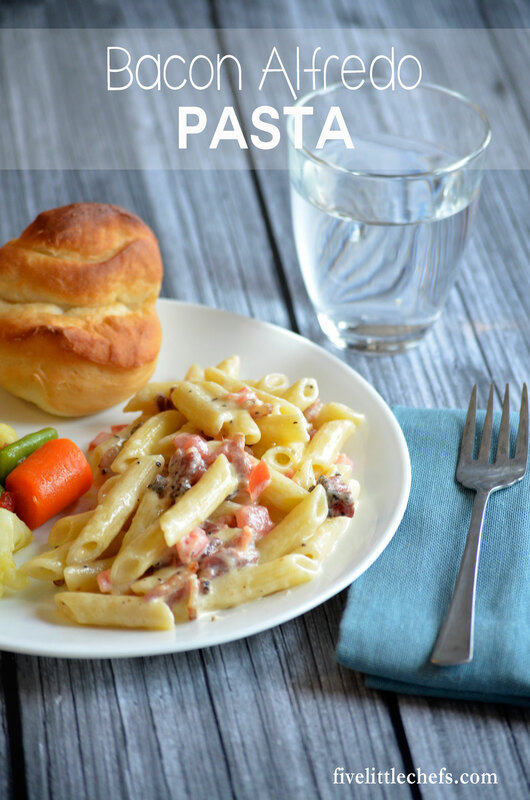 This bacon alfredo pasta recipe uses not the regular fettuccine noodles, though you could if you wanted, but any type of pasta. While that is cooking the recipe for alfredo sauce is basic. Use another medium saucepan to combine the heavy cream, butter, salt and course pepper. When it bubbles your pasta will hopefully be done and drained, reserving a little of the water for later. Add the alfredo sauce to the pasta add a diced tomato and some crispy thick cut peppered bacon and the reserved water. See I had to add in even more pepper with the bacon because I love it so much in alfredo. The tomato brings some freshness and color. We love this easy recipe! Adding in the reserved pasta liquid may make the sauce a little thinner at the beginning, but then it will thicken the sauce and help it to stick to the pasta. Try cutting the bacon into small pieces before frying for a faster cook time and less mess afterward. Make sure to let it drain on paper towels before adding it to the pasta. Cook the pasta to boiling in salted water according to package directions. Drain, reserving ¼ cup of the liquid. In a medium saucepan combine cream, butter, salt and pepper until bubbly. Pour sauce over drained pasta. Stir in the parmesan cheese until melted. Add in the ¼ cup reserved pasta liquid, combine. Add the bacon and tomato then stir to combine. No Replies to "Bacon Alfredo Pasta"